FRUITVALE STATION follows the true story of Oscar Grant (Michael B. Jordan), a 22-year-old Bay Area resident who wakes up on the morning of December 31, 2008 and feels something in the air. Not sure what it is, he takes it as a sign to get a head start on his resolutions: being a better son to his mother (Octavia Spencer), whose birthday falls on New Year’s Eve, being a better partner to his girlfriend Sophina (Melonie Diaz), who he hasn’t been completely honest with as of late, and being a better father to Tatiana (Ariana Neal), their beautiful four year-old daughter. Crossing paths with friends, family, and strangers, Oscar starts out well, but as the day goes on, he realizes that change is not going to come easily. His resolve takes a tragic turn, however, when BART officers shoot him in cold blood at the Fruitvale subway stop on New Year’s Day. Oscar’s life and tragic death would shake the Bay Area – and the entire nation – to its very core. 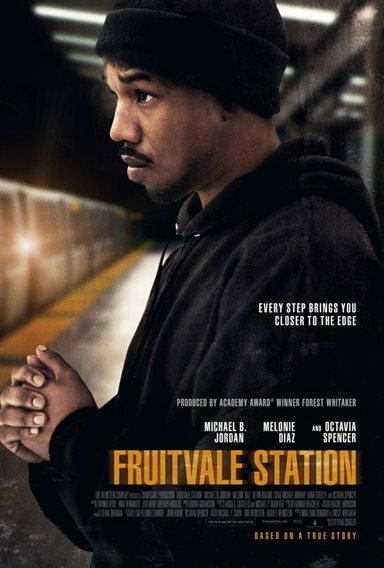 Download Fruitvale Station in Digital HD from the iTunes store. Fruitvale Station images are © Weinstein Company, The. All Rights Reserved. The true story of an incident that boggles the mind called Fruitvale Station makes a bleak statement on the excessive power of America's police. Actual footage of the rancor that took place on New Year's Eve 2008 in Oakland, California gives testimony to a growing problem that should be universally addressed in all phases of our justice system. The must see film opens wounds that never seem to be healed. The first 60 seconds of the movie shows a cell phone video of a black man being taken down by police and then a final ‘bang'. Flash back two days earlier as we see 22-year-old Oscar Grant (Michael B. Jordan) dealing with the daily drama of being a father to 4-year-old Tatiana (Ariana Neal) and companion to Sophina (Melonie Diaz) his Hispanic girlfriend and mother of the child. During the next 60 minutes witness Oscar's drama with his past prison stay where he has a run in with a Hispanic gang member, hiding truths from his mother, breaking a deal to sell pot and other situations that lead to a birthday party for his mom (Octavia Spencer) on New Year's Eve 2008. When Oscar agrees to take his mother's advice and ride the BART to San Francisco to see fireworks, the family's lives will change forever. First time feature director Ryan Coogler does an admirable job with the subject matter, keeping it taut and powerful, but not overstating the message. His work with Fruitvale Station reminds me of director John Singleton who started his career with another volatile film called Boyz in the Hood that earned him two Oscar nominations. Coogler could get equal recognition for his handling of this drama as it pulls excellent performances out of his cast, takes aim at a subject important to America, and delivers a strong message without the rhetoric that sometimes dampens a true narrative. Actor Michael B. Jordan whom I often admire in roles like the super powered Steve Montgomery in Chronicle, Maurice Wilson in Red Tails, and one of the scrappy members of a Cinderella baseball team in Hard Ball. Here however he gets serious, and he's brilliant portraying an ex-con trying to go straight and making amends for his sordid past. He makes his character both likeable and unlikeable at the same time showing both sides of Oscar Grant. Coogler pushes Jordan to another level as a bad boy who won't take things as they are and this is the plot point that's most damaging. Oscar can't come to terms with his ways and has not healed from the hurt he received growing up, often choosing his own course of right versus wrong. Even in the final moments of his life he cannot resist fighting for his rights, but this time in the wrong place at the wrong time. The cinematography by Rachel Morrison fits the bleak story adding a depressing aura that keeps director Ryan Coogler's narrative in tune with the message. She gets startling close-ups of Oscar Grant's dealings with life trials while showing the softness coming through in scenes depicting his relationship with Tatiana. The most memorable picture however comes with the confrontation on BART where Morrison points her camera at the fury within, then turns it on Oscar for one more foreboding shot. The film has been rated R by the MPAA for some violence, language throughout and some drug use. Be cautious when deciding to allow immature children see the film as it does have some scenes that may be very inappropriate.